Matthew Stafford has struggled mightily so far this season. Pay doesn’t always equal performance in the NFL. Teams spend millions in projecting what they think will happen with players, but reality often doesn’t cooperate. The 2015 season has provided many more examples. Only seven players have a bigger cap hit in 2015 than Stafford, but the Lions quarterback has been among the worst at his position through five games. His eight interceptions lead the NFL, while his passer rating of 74.8 ranks 33rd among 35 qualified quarterbacks. 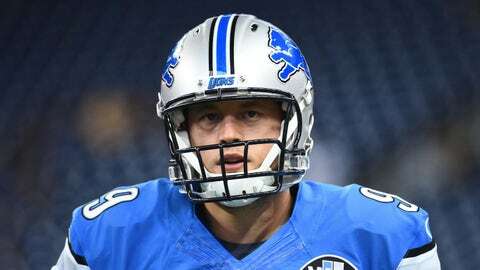 The now 0-5 Lions benched him in the second half of last week’s home drubbing to the Cardinals. The Panthers certainly expected more from the running back with the fifth-highest cap hit in 2015. Through four games, Stewart has just 220 rushing yards and one run over 20 yards. He’s averaging 3.7 yards per carry, with zero touchdowns and only six first-down runs. At his current pace, Stewart will gain just shy of 900 rushing yards. Megatron is on pace for 102 catches in 2015, but his huge salary (only two players are counting more against their team’s respective caps this season) demands more. Much more. Johnson has only one touchdown catch, and his next best chance at a score ended in a fumble at the goal line late in the fourth quarter in Seattle. He’s being paid like one of the game’s transcendent players. But through five weeks, 24 players have more receiving yards. Cook’s contract remains one of the worst in the NFL. Despite possessing the fourth-highest cap hit among tight ends, Cook has just 15 catches for 169 yards and zero touchdowns in 2015. If he sticks to his current pace, the Rams tight end will finish this season with less than 50 catches and 600 yards. St. Louis is getting used to disappointment from its big investment. The Rams are paying Saffold like a top offensive tackle, but he’s nothing more than a below average guard. Now, Saffold might miss the rest of the 2015 season with an injured shoulder, according to Adam Caplan of ESPN. Getting hurt is unfortunate; playing poorly at a low-value position is another matter entirely. Wake has been all but invisible to start 2015. Through four games, he has just one tackle and zero sacks for a defensive line expected to take a huge step with Ndamukong Suh. He is 33 years old, but Wake was a dominant player for the Dolphins a year ago. Maybe Father Time claimed another (expensive) victim. Only three linebackers have a bigger cap hit in 2015 than Timmons: Clay Matthews, Julius Peppers and Von Miller. The Steelers linebacker can’t compare to the impact provided by those three. In fact, Pro Football Focus has graded Timmons poorly in terms of both stopping the run and in coverage to start this season. He’s an average player on a very average defense. Carr hasn’t been a train wreck in 2015, but he is one of just 12 cornerbacks to allow at least three touchdown passes this season. The Cowboys thought they were getting a legitimate shutdown cornerback when they signed Carr in 2012, but he’s never lived up to the label. His $12.7 million cap hit ranks third at the position this season, with Darrelle Revis and Patrick Peterson ahead of him and Richard Sherman only slightly behind at No. 4. Carr is obviously the ugly duckling of the group. Only cornerback Jason McCourty is counting more against the Titans cap this season. Overall, Griffen has the third highest cap hit among NFL safeties. He has defended just one pass with zero turnover plays in 2015. The 30-year-old safety gives up too many big plays and creates too few. Walsh has been an adventure since August. After missing seven kicks (six field goals, one extra point) during the preseason, Walsh has at least one miss in three of four regular-season games. That’s no way to repay the Vikings, who gave the 25-year-old a big extension this offseason.